Hadhrat Khwaja Abd al-Khaliq al-Ghujdawani qaddas-Allahu sirrahu was born on 22 Sha’ban 435 AH in Ghujdawan near Bukhara (modern-day Uzbekistan). He received the silent recollection (Al-dhikr Al-Qalbi) in his youth from Al-Khidr (peace be upon him), and persisted with the said recollection. 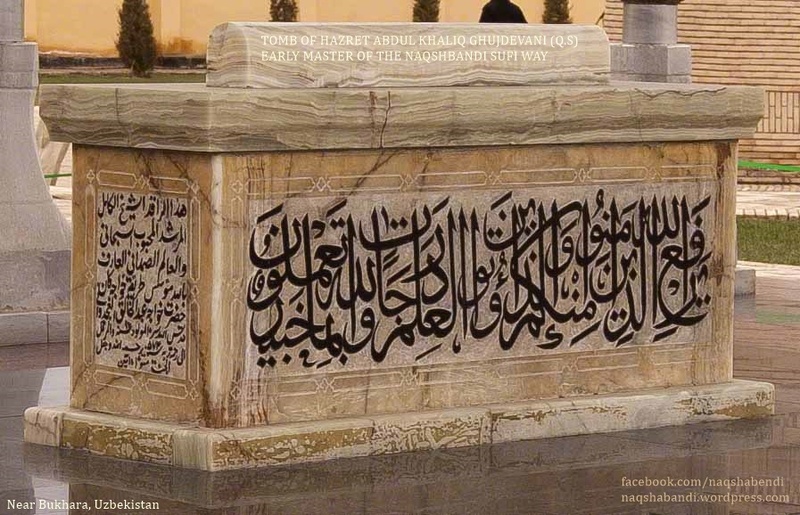 Al Khidr (alaihissalam) accepted him as a son and commanded him to become absorbed in it and to say in his heart under the water “there is no god but Allah and Muhammad (peace and blessings of Allah be upon him) is the Messenger ofu Allah”. The Khwajah did it. He learned this from himand engaged himself with this there, until all sorts of openings and elevations occurred to him beyond the perception of discernment. The Manner of his engagement , his goal , and his utmost perfection were acceptabe and desirable from beginning to end among all people. When Khwajah Yusuf Al Hamadani (Qaddasallahu Sirrahu) arrived in Bukhara , Khwajag Abdul Khaliq (Qaddasallahu Sirrahu) came to visit him and, as he learned that he too is enggaged in the silent Dhikr,he benefited from his company (sohbat) and attended him during his stay in Bukhara. Therefore, it is said that Al Khidr (Peace be upon him), was his master in instruction and inspiration while Khwajaha Yusuf Al Hamadani (Qaddasallahu Sirrahu) was his master in accompaniment.